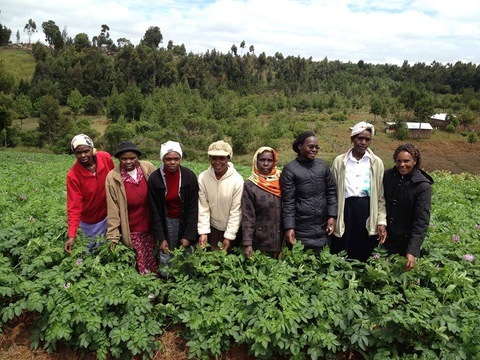 The Farmers Together program uses seed multiplication plots to help women farmers in Kenya grow potatoes. Photos courtesy of Njabini Inc.
It’s not an overstatement to say it gets frigid in Boston. So the company Mike Behan started while attending Northeastern University began by selling slouchy knit hats and scarves. 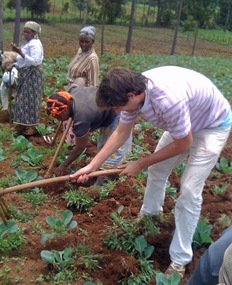 It has since grown to support its main mission of helping women farmers in Kenya. Behan, CEO and co-founder of Njabini Inc., graduated from Northeastern this year. While enrolled in the school’s Social Enterprise Institute, he traveled to a village called Njabini near Nairobi, Kenya, for six months out of the year for multiple years to focus on his business. Njabini Inc. has two different enterprises: Njabini Apparel, which was started in 2010, and an agriculture-centered enterprise called Wakulima Pamoja (or Farmers Together in Kiswahili), which began in 2011. Behan said he was fortunate to attend a university that enabled him to alternate going to classes for six months and working full-time on his project for the other half of the year. Behan tries his hand in the fields. As a freshman, he first traveled to the southern village of Njabini, where a friend had started an orphanage. After volunteering there, he began his company the following fall. Farmers Together uses a cooperative model of clustering about 20 farmers into producer groups. As a bloc, they can purchase more planting materials and get a larger discount. They are supplied a credit to help them get started. In 2012, Njabini Inc. launched a project to train and supply selected farmers with planting materials for one of Kenya’s leading crops: potatoes. A fundraising campaign to build two aeroponic greenhouse systems to grow seedlings didn’t reach its $35,000 goal, instead raising only about $10,000. “Midway through that campaign, we realized the aeroponics technology wouldn’t be appropriate” for cultivating the seedlings, he said. So they closed the campaign and used the money they raised for other aspects of the program, including supplying farmers with planting materials. 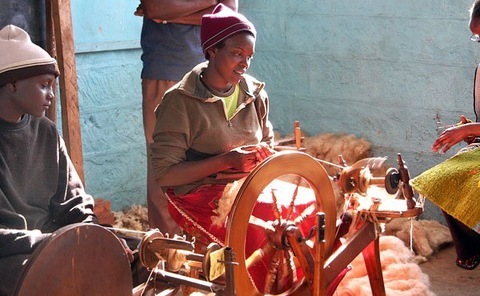 A woman spins yarn for Njabini Apparel. One of the initial women trained and equipped for the farm project was Lucy Wanjiku. She and her husband had moved to Njabini after her home in Rift Valley was burned down and her three children were killed during Kenya’s post-election violence in 2008. Mwangi had contacts and knowledge about the local agricultural economy. The two worked together on some projects and became friends. 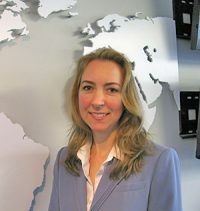 Behan soon made him the organization’s Kenya country director. Behan’s goal is to someday turn Njabini Apparel over to an all-local staff. He now serves on the board as an adviser, and said he expects the full transition to take about a year with co-founder Mwangi eventually installed as CEO. The NewsHour is highlighting individuals helping communities solve problems, build businesses and create jobs on its Social Entrepreneurship page.